The Kitschinn kombucha tap room and juicery offers vegan smoothies, baked goods, cold-pressed juice and the option to mix in CBD oil, vegan protein, collagen and other additions. For Mary Deviley, her Sister Bay juicery isn’t just a business venture, it’s a reflection of who she is, where she’s been and the lifestyle her and her growing family have built together. Originally from Texas, Mary and her husband Nick first met while she was writing freelance and traveling. He parked his RV next to hers at Coachella in 2006 and now, 12 years and four children later, they’ve found a home and cultivated a blossoming business in Door County. On the afternoon I popped into the vintage decorated cafe, she was behind the counter prepping ingredients with assistance from one of her young daughters. 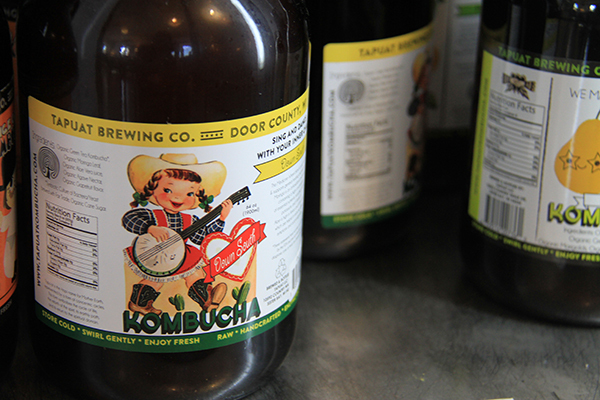 They had just come from tending to their kombucha brewing operation, Tapuat Kombucha, a growing kombucha brand currently distributed across the Midwest. 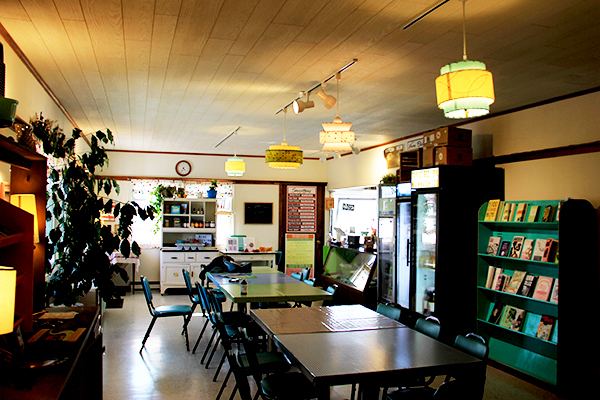 The Kitschinn doubles as a tap room for Tapuat and a juicery serving cold-pressed juices, fresh made smoothies and more gluten-free, vegan products. 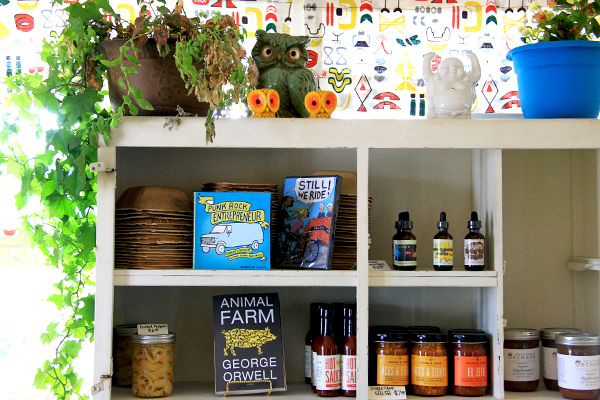 The name “Kitchsinn” comes from her love of collecting vintage, kitschy items. Opened on July 1, 2017, the Kitschinn was able to embrace the nostalgic feel of what was once called The Patio — a seasonal drive-in eatery serving classic burgers, shakes and fries from the windows. Now winterized and updated, the space has kept the 1950s aura with a bit of modern flair. “My husband is a minimalist, so this kind of became my place to collect things,” said Mary. Her creatively curated vintage art, lights, signs and figurines can be spotted throughout the space, giving off an edgy, mid-century feel. Before opening the Kitschinn, Mary worked in her father’s coffee shop in Texas, and more recently, a juice bar that once operated next door to Greens N Grains in Egg Harbor. Her venture into juice bars stemmed from her long-time interest in the science and trends of food in relation to health and wellness. “I’ve been a vegetarian since I was young, and as a college athlete I was always making smoothies for my teammates to show them you can be an athlete and be vegetarian,” she said. 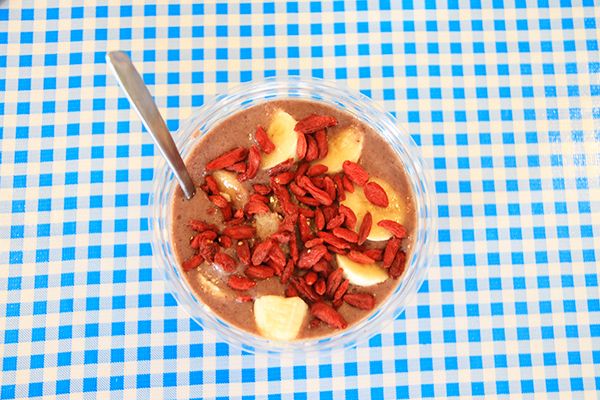 After perusing the menu, I decided on an acai bowl topped with sliced banana, dried goji berries and a dollop of almond butter. Bowls are essentially a smoothie or “nice cream” (vegan ice cream) served in a bowl with a spoon instead of a cup in order to sprinkle on and stir in your selection of toppings. All of the ingredients are 100 percent organic, gluten free and vegan, which is impressive considering the menu is a four-page pamphlet (not including the daily bakery specials). You will find everything from fresh fruits, cold-pressed juices, and dairy-free milk to just-picked greens, dried berries, seeds, nuts, protein powders, collagen, hemp, matcha — the options are varied and plentiful. A standout on the menu is the option to add-in 25 milligrams of CBD infused in honey or coconut oil for $2. CBD is short for cannabidiol oil, a hemp product used to reduce exercise-induced inflammation, mild anxiety and pain. For someone who is interested in testing the possible benefits for themselves, you can add it to a smoothie or purchase to apply topically. “It’s absorbed easily through the skin, which some people prefer. There’s still a stigma attached to CBD and consuming it,” said Mary. On the juice side of the menu, you can choose from the premade daily blends or create your own with seasonal fruits and veggies. For cooler fall and winter days, I have my eye on the Warm Elixirs, which are an array of interesting concoctions that sound ideal for cozying up to, including a Turmeric Golden Mylk, Beet Latte and Bulletproof Coffee — a high-fat coffee drink famous in the Keto crowd.